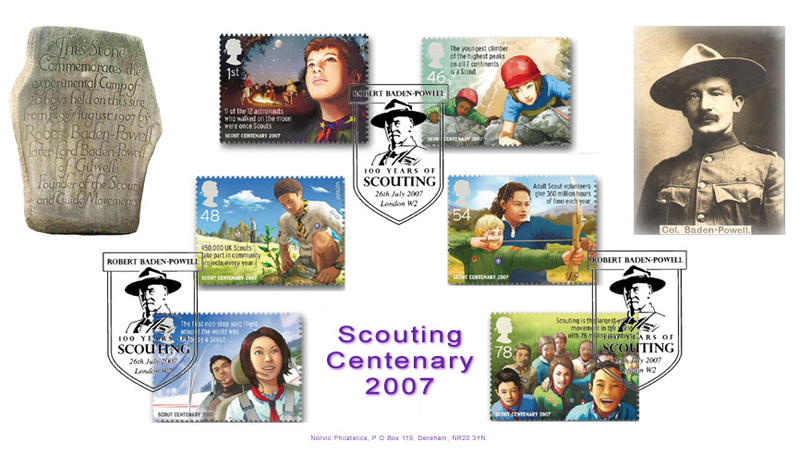 Centenary of Scouting - Great Britain stamps 26 July 2007, from Norvic Philatelics. In 1907 Robert Baden-Powell held an experimental camp on Brownsea Island, Poole, Dorset, to try out his ideas. He brought together 20 boys, some from public schools and some from working class homes, and put them into camp under his leadership. 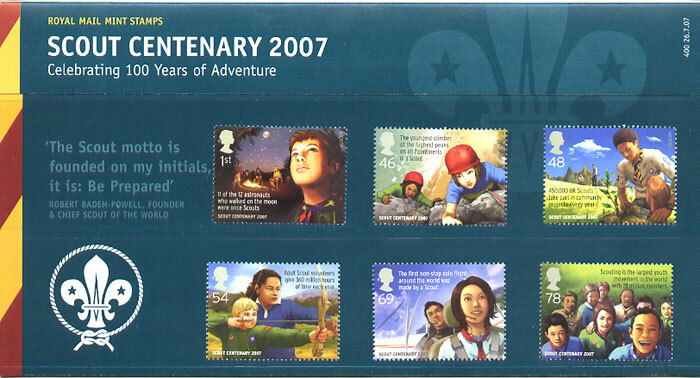 This was the start of The Scouts Association and 2007 marks its centenary, commemorated by Royal Mail with a set of six stamps. 1st Class: 11 of the 12 astronauts who walked on the Moon were once Scouts: A young Scout looks to the Moon. 46p: The youngest climber of the highest peaks on all 7 continents was a Scout: A pair of Scouts conquer a mountain. 48p: 450,000 UK Scouts take part in community projects every year: A young Scout plants a tree. 54p: Adult Scout volunteers give over 360 million hours of time each year: An adult volunteer helps a youngster with archery practice. 69p: The first non-stop solo flight around the world was made by a Scout: A Scout pilots an aircraft. 78p: Scouting is the largest youth movement in the world with 28 million members: Scouts get together to celebrate 100 Years of Scouting. Can you imagine a world without Scouting? Without the adventure, the Jamborees, the summer camps, the familiar sight of badges, neckerchiefs and riotous gang shows? It would be a quieter world, somehow less colourful and a great deal less friendly. Fortunately, we don't have to imagine such a thing, because in 1907, a fifty-year old soldier called Robert Baden-Powell struck upon a wonderful idea. Scouting began 100 years ago on Brownsea Island, Poole, in Dorset with a camp for twenty young people of different backgrounds. Convinced that young people in Britain could benefit from an active, outdoor programme, Baden-Powell planned eight days of woodcraft skills, life saving, 'campfire yarns' and team games, designed to encourage initiative and responsibility. The camp was agreed by all to be a great success. In 1908, Baden-Powell outlined his scheme including some the stories from Brownsea, in his best selling book Scouting for Boys, and a Movement was born. Today, Scouting offers challenge and adventure to 450,000 adults and young people in the United Kingdom and 28 million worldwide. Helping girls and boys reach their potential by developing team building and leadership skills, Scouting operates in all but six countries of the world. Despite different uniforms, programme and economic advantages all are united by a common Promise - to help other people and do their best. Every four years, Scouts gather together for an amazing event - the World Scout Jamboree. Camping, working and playing together in a vast tented city young people learn about each other's food, customs and cultures and confront issues as diverse as landmines, debt and poverty. Jamborees are a powerful display of international friendship and it is not uncommon for Scouts whose countries are at war to be sharing a meal. 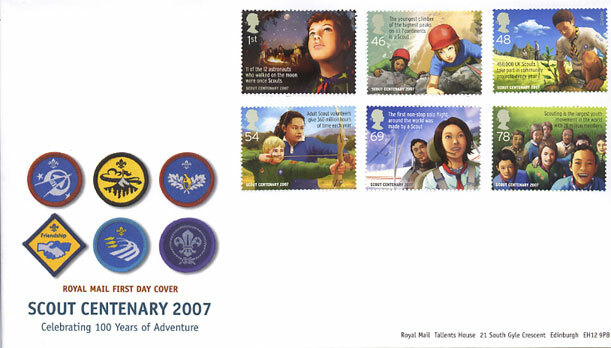 In July and August 2007, just as these stamps were issued, 40,000 Scouts from over 150 countries came to the United Kingdom for the 21st World Scout Jamboree - the largest Scouting event in this country for fifty years. It is not just an amazing celebration of adventure and Scouting's Centenary, but a festival for peace at a time of continued global conflict. To coincide with World Scouting Jamboree being held in Essex, Royal Mail will be issuing a particularly appropriate product, last seen in 1993 - Prepaid Postcards. Larger than the standard Stamp Cards, these six postcards also bear enlarged images of the Mint Stamps but contain reproductions of the first class or worldwide postcard rate stamps printed on the back making them valid for postage. The 1st class, 46p and 48p Prepaid Postcards are imprinted with the 1st Class stamp and 54p, 69p and 78p cards with the 54p stamp. The stamps and postcards are printed in lithography by John Enschede Security Print in shesst of 25/50. 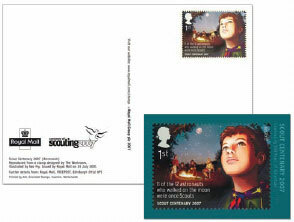 The Scouts wanted the stamps to show the contemporary nature of Scouting and for this reason the illustrator Jez Fry was chosen. Jez is half Japanese and works in a style similar to Japanese Manga (comic illustration) and Anime (film animation). All images except FDCs are Copyright Royal Mail 2006/07. Our cover for this issue shows the commemorative stone at Brownsea Island and an early portrait of Lord (then Colonel) Baden-Powell, and will be available cancelled with either L10609 (Brownsea Island) or L10605 (London, Baden-Powell) as shown - price £8.95 each. 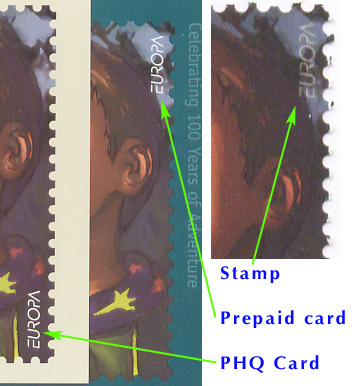 Postmarks available for the day of issue are shown below; These may not be to scale. These cannot be obtained after 26 July. 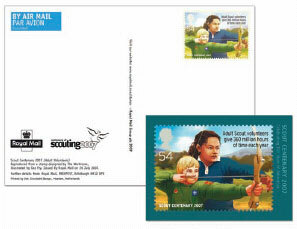 2006 2007 stamp issues Visit our online shop!